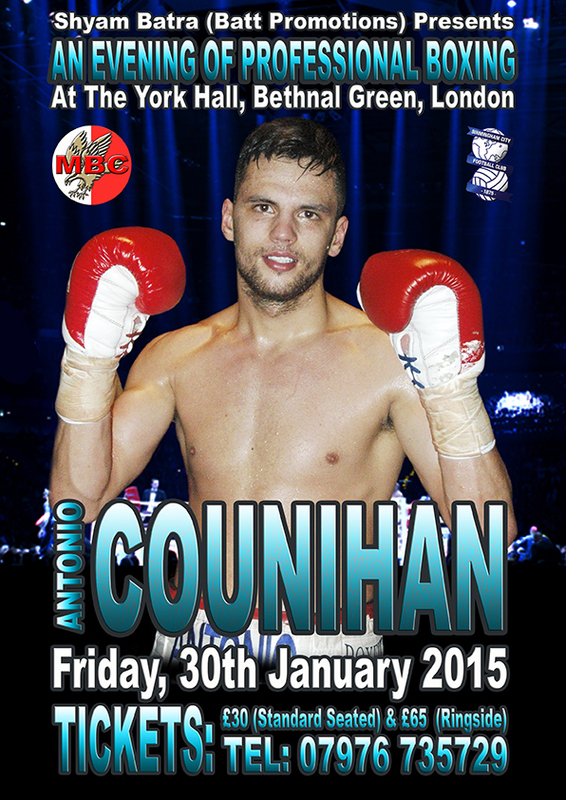 London – Monday, 26th January 2015 - Solihull’s Antonio Counihan has a date with destiny this coming Friday, when he faces Hungary’s David Kis, on the Shyam Batra promoted LEGENDS & PROSPECTS event at York Hall in Bethnal Green, London on the 30th January. A good solid win this Friday is sure to set 23 year old Antonio firmly on course for a shot at either a domestic or International title later this year, even though this will be only his fifth professional bout. Antonio’s excellent amateur pedigree is already well documented, former England captain, oodles of domestic and international accolades overflowing in his trophy cabinet etc, but it’s his impressive performances since turning pro, in October 2013, that make this youngster stand out head and shoulders above his peers in the Lightweight division. Four outings, four victories is not that unusual for any upcoming prospect, but it’s not just these wins that makes him such a standout, it’s the way he totally outclassed and dominated each and every one of his opponents from start to finish, so much so that three of his opponents failed to go the distance, with just the one, Marcin Ficner, managing to hang on to hear the final bell, albeit losing by a shut out 40-36 points margin. With these four excellent wins under his belt, it comes as no surprise that Antonio has been making a serious impression on a number of luminaries of the sport, including one of the most respected manager/coaches in the business, Champion TKO’s Johnny Eames, who clearly believes that young Antonio is already a genuine Championship contender, as he made clear when he spoke earlier. “What can I say about Antonio Counihan, this kid is really special. Like I said previously Antionio is the jewel in the crown, unfortunately he doesn’t box on a British Board of Control license, that’s one of those things, that’s the British Boxing Board of Control’s loss, not anybody else’s. He’ll definitely, definitely will end up a Champion of some sort, that’s no doubt, we’re talking about this coming season, not the next seasons or whatever. 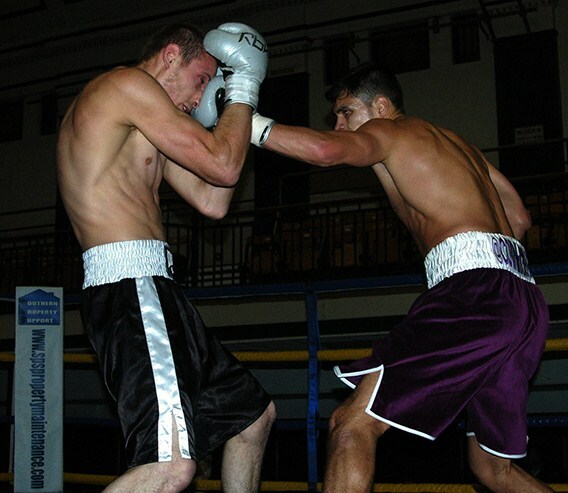 Top class international amateur, unbeaten in four as a pro and has looked better and better each fight. A lot of praise goes to his father Paul and trainer Jon Pegg, who bring him fully prepared each time, he has a great following, his fans are fantastic, they come down from Birmingham each time he fights in London, which ain’t cheap and they are very, very vociferous with their support. Following the praise lavished upon him, by the esteemed Mr. Eames’, Antonio seemed a little taken aback when he spoke. Antonio then steered the conversation to the upcoming showdown with David Kis at York Hall on Friday as well as touched on the possibility of a title fight in Birmingham later this year. “Yeah, off to London again this Friday, I can’t wait. Everything’s been going really well, training’s been very good and all the fans have been buying tickets again, yeah looking forward to it, can’t wait to get in there again. I know David’s (Kis) record, he has a half/half record, but I’ve never seen him box or anything, so don’t really know too much about him, I do my thing so don’t really need to know much about him. Hopefully I’ll get a title fight soon, I don’t know the timing of it but yeah I’m ready when my team says I am, I did a six rounder last time out and have a six rounder this time too, so yeah definitely ready for a title fight when the team says I’m ready. I’d love to fight for the title in Birmingham, I haven’t fought here for a while now, even my last amateur fights were internationals, for England and Great Britain, in fact I can’t remember the last time I fought in Birmingham. Antonio Counihan versus David Kis will feature on the Shyam Batra promoted ‘LEGENDS & PROSPECTS event, headlined by George Hillyard versus Michal Vosyka WBU International Middleweight title clash, that takes place at York Hall in Bethnal Green, London, on Friday, 30th January 2015.